Powers/Abilities/Functions: The Thought Projector Helmet was a portable, self-contained device which, when worn over the user's head, could project realistic 3-D images of what the user was thinking of. (Fantastic Four I#27) - After building the Thought Projector Helmet, Reed Richards was demonstrating it to his three teammates. He projected an image of Sue Storm in a swimsuit, causing a little embarrassment for Sue (although the Thing was happy to see that his friend had more on his mind than just science). The Human Torch (Johnny Storm) thought the gadget looked like fun, so he asked Reed if he could try it next, but Reed admonished him, telling him it wasn't a toy -- he was trying to develop the device as an aid to crime-fighting. 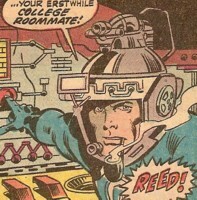 The Thing wanted to try the helmet, so Reed (realizing Ben wouldn't be happy until he got a turn) put the device on his head, advising him to relax. But thinking that the helmet looked like something Dr. Doom had created, the Thing inadvertently projected an image of Dr. Doom hurling a grenade -- the image was so realistic that the shocked Thing fell out of his chair. Not wishing to have her own thoughts revealed, Sue decided to leave the room. (Strange Tales I#126/1) - After the Thing was forced to attack the Human Torch against his will, the two went to Reed Richards to find out who was actually behind the attack. 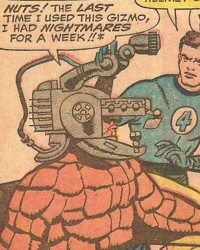 Reed placed the Thought Projector Helmet on the Thing's head, and it revealed the true culprit by projecting an image of the Puppet Master's face. (Fantastic Four I#126) - Reed Richards was testing a "new, improved" version of the helmet by concentrating on the most repulsive scene he could imagine -- his wife Sue murdered by Dr. Doom. The test was interrupted by the Thing, who mistakenly thought the projected scene was real. Later, while he was alone, the Thing used the helmet by thinking of the most repulsive thing he could think of -- himself, in his original form. Feeling nostalgic, he then created more images to review the events of the team's origin, followed by their first battle with the Mole Man (@ Fantastic Four I#1), and then the events of the last time they battled the Mole Man (@ Fantastic Four I#88-90). (Fantastic Four I#250) - Gladiator of the Imperial Guard was running amok in New York, hunting for Skrulls. In an effort to stop the alien superman, Reed used the helmet to project an image of himself over Captain America -- while Gladiator was striking "Reed," he was actually striking Cap, who was protecting himself with his nearly indestructible shield. When Gladiator saw his physical attacks and "heat vision" having no effect on "Reed," it was enough to make him doubt his powers for a moment, which was just long enough for the Invisible Girl to knock Gladiator out with a force field. And a BIG Thank You to Dennis Giansante for his help with the first scan!